Seattle is an era of streetcar expansion, which is good news for commuters, businesses, and transit enthusiasts alike. In an update to an earlier post, on Monday the Seattle City Council approved further study and pursuit of federal funding for a downtown streetcar line on 1st Avenue. 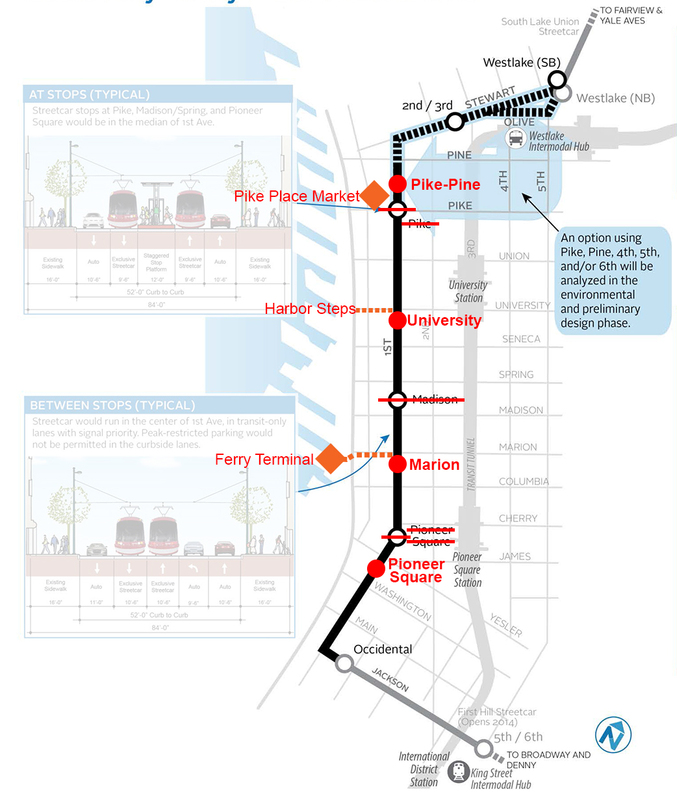 This will connect the First Hill and South Lake Union (SLU) lines possibly by 2018. Seattle Streetcar, the official name of the network, is also studying a short extension of the First Hill line. This post will look at why streetcars are returning to the fore and propose additional connections between the city’s central neighborhoods. Streetcars are not new to Seattle. According to HistoryLink, the city first opened a horse-drawn streetcar in 1884. Private entrepreneurs eventually expanded the system (which was later consolidated under public ownership) with cable-drawn and electric streetcars to 29 routes on 231 miles of track by 1936. However, a combination of financial problems and the emerging dominance of the automobile led to the system’s dismantling in 1941. The following decades saw several efforts to revive a citywide or regional rail system, but political willpower was lacking. The 1 mile Seattle Monorail, constructed in 1962 for the World’s Fair, was to be expanded into a citywide system until Seattle voters defeated the project in 2005. 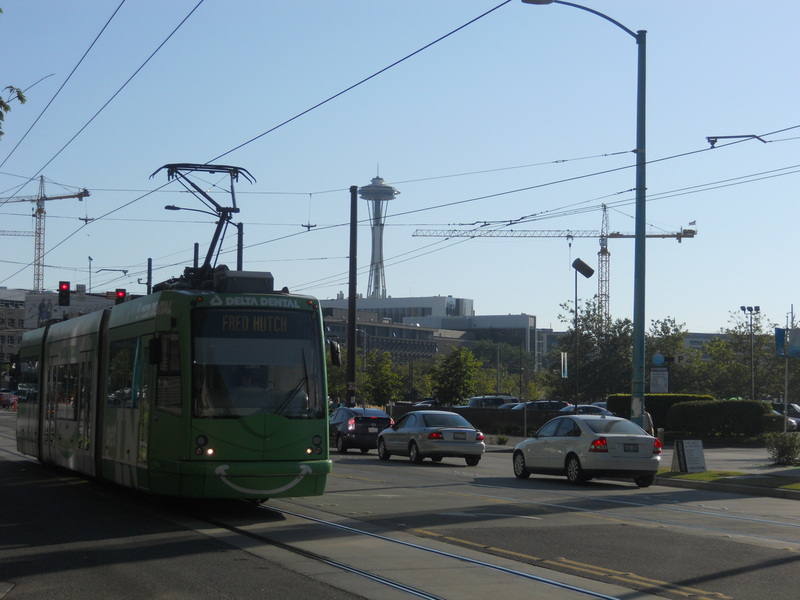 A 1.6 mile streetcar line operated on the Seattle waterfront from 1982 to 2005, when its maintenance shed was replaced by the Olympic Sculpture Park. 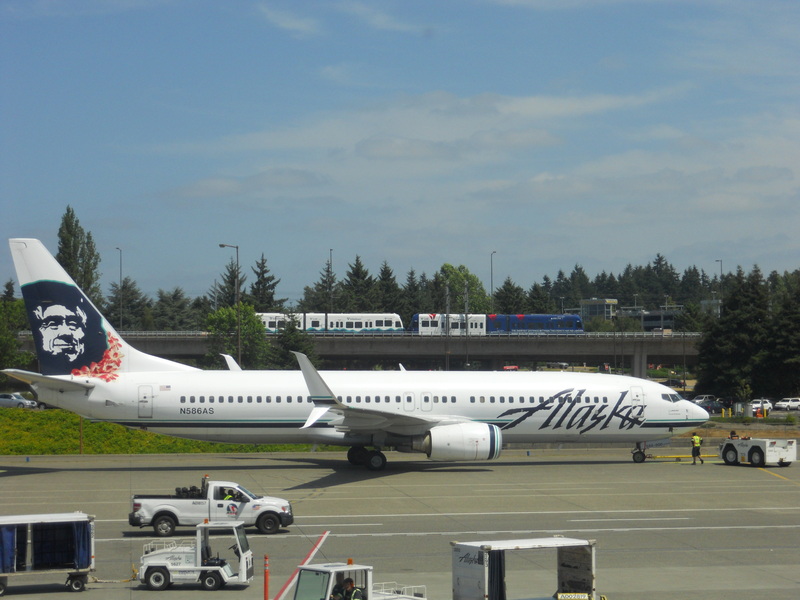 Connecting a region’s airport with its central city’s downtown is a good first step for a new rapid transit network in growing metropolitan areas. Only recently has the region returned to rail. The councils of King, Snohomish, and Pierce Counties created Sound Transit in 1996 to plan and manage a regional transit network. Sounder commuter rail began service between Seattle and Tacoma in 2000 and between Everett and Seattle in 2003. Tacoma also got a small streetcar line in 2003. The City of Seattle opened the 1.3 mile SLU line in that redeveloping industrial neighborhood in 2007. In 2009, the region’s first light rail line started running between downtown Seattle and Sea-Tac airport; multiple light rail expansions are currently being constructed or planned for opening by 2021. Seattle’s First Hill streetcar is expected to open later this year, connecting the Pioneer Square, International District, and Capitol Hill neighborhoods. With impending bus service cuts, it is prudent to discuss the relevance of streetcars, which are expensive to build in urban areas – two-way lines cost $30-40 million per mile. As modes of transit, streetcars are competitive with buses in the same way that light rail is competitive with bus rapid transit. Like buses, streetcars are intended to operate on surface streets and provide local service, whereas light rail often runs above or below ground and has greater distances between stops. But along with their environmental and economic benefits, streetcars also have a number of operating characteristics that make them preferable over buses in a city’s busiest corridors and the densest neighborhoods, helping to explain their recent resurgence in American cities. The point of modern streetcars is to move many people quickly between neighborhoods. This guides the reasoning in which each streetcar station becomes a significant investment. To begin with, the stations have platforms that are level with the floor of the vehicle. This allows people with disabilities, wheeled devices, and bulky items to board more quickly than waiting for lift deployment or loading a bike rack on a bus. Streetcar operators are also in a separated cabin, so customers can’t hold up a line by talking to them (admittedly, a double-edged sword). Additionally, the stations have shelter, lighting, and power for off-board fare payment devices, which also saves time. Because of these increased expenses, stations are spaced further apart, which also allows streetcars to move quickly than a local bus. When sharing lanes with cars, though, streetcars can still be delayed by traffic. The streetcar vehicle that Seattle is using, the Inekon 12 Trio, also has three doors on each side that enable faster and simultaneous boarding and deboarding, along with flexibility in station design. This model has an advertised capacity of 199 passengers, compared to about 115 for a typical Metro bendy bus (PDF; see DE60LF model). Streetcars are more comfortable to ride (tracks instead of potholes), and are quieter due to their electric propulsion. And for some reason people prefer rail over buses, even given identical service. Perhaps the physical rails provide some certainty to commuters and private investors, as train routes can’t be rearranged like a bus. As Seattle’s transit network grows, though, streetcars cannot and should not entirely replace local buses for less busy routes. Streetcars are best suited for the most high-demand routes with pedestrian-oriented destinations, such as retail districts, major institutions, employment centers, and transportation hubs. 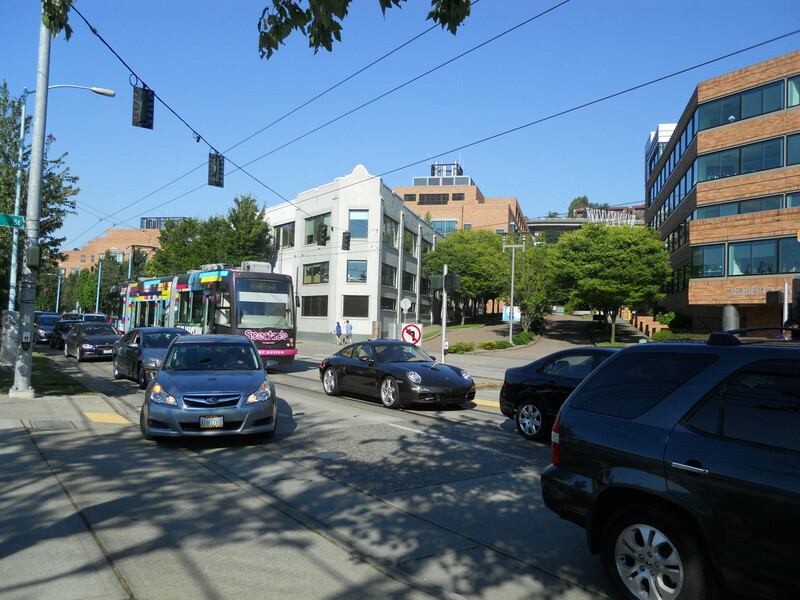 Ideally, streetcars travel in transit-only lanes to avoid conflicts with cars and delays from other traffic; Seattle’s SLU line is sluggish during peak hours, and would move faster if it had a dedicated lane. And like buses, streetcars can also be outfitted with transit-priority systems that talk to traffic lights. But it’s not always important for streetcars to move faster than cars, as long as they’re moving lots of people at once. The concept of place mobility frames transit as “placemaking” device, adding to the atmosphere of urban areas and drawing in residents and businesses. Indeed, in the right places streetcars can be a powerful economic tool, stimulating redevelopment and increasing a city’s tax base enough to eventually pay for itself; Portland’s $100 million streetcar has helped generate over $2 billion in new construction. UPDATE: After seeing some of the responses to the above paragraphs, I asked the Seattle Department of Transportation (SDOT) if they actually have any information on obstructions to streetcars. And in fact, they have been recording this kind of data for the SLU line since January 2014. SDOT’s Paul Elliot says, “…the biggest challenge is general traffic congestion, rather than blocking accidents. Parked cars or trucks block the streetcar on occasion. Vehicles are towed if need be. Accidents blocking the intersection are rare, and typically moved away from the track quickly.” I was provided the below table. The crux of the arguement for providing streetcars with dedicated lanes is to avoid delays caused by vehicular obstructions, a worthy goal. But these numbers don’t appear to support that position, at least not directly; there is an average of only three accidents or other obstructions per month. The heavy traffic column shows an average of 10 abnormal delays per month. That’s not surprising in heavily-congested Seattle and would be celebrated by any bus commuter, but does illustrate the potential of dedicated lanes. However, this data’s usefulness is limited unless it can be compared to delays experienced by King County Metro (especially routes with dedicated bus lanes) or other streetcar lines in U.S. cities. 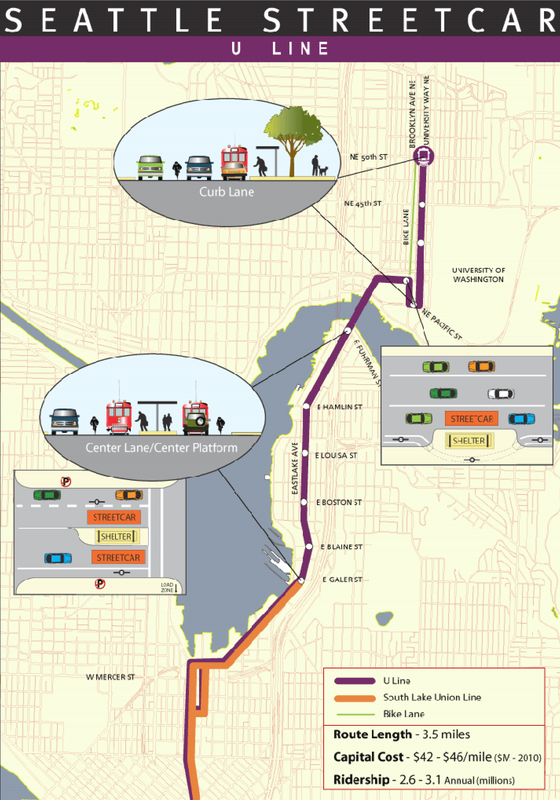 The Seattle City Council recently adopted the “locally preferred alternative” of the Center City Connector, which will connect the existing SLU line and new First Hill line. City staff can now begin more detailed design and seek federal funding, which is likely. It will travel in exclusive lanes, which is much faster than using general traffic lanes. However, the conceptual stop locations are problematic because they don’t connect well with key locations. See the below image for proposed revisions. To serve the ferry terminal better there needs to be a top on the south side of the Marion Street intersection. This is because there is a footbridge along the south side of Marion Street between Alaskan Way and 1st Avenue, and at this location people could walk directly between the streetcar and footbridge. To maintain stop spacing of about three blocks, the Pioneer Square stop could be moved one block south, which is still nearby the bus tunnel station on 3rd Avenue. A new stop is proposed at University Street, where the Harbor Steps provide an important connection to the waterfront. The Pike Street stop would be moved to the middle of the Pike-Pine block. The 2nd/3rd stop could probably be eliminated because a stop at Westlake is nearby. The U-Line is introduced in the 2008 Streetcar Network Development Report (PDF; page 24). It is envisioned as a 3.5 mile extension of the SLU line, connecting to the Eastlake and U-District neighborhoods. No less than five (70, 71, 72, 73, 74X) bus lines run the same route between the U-District and Downtown and all are often overcrowded; in the Puget Sound the U-District is second only to downtown Seattle as a travel destination. The U-Line could consolidate these buses into a single transit line between downtown and the U-District while increasing speed and capacity. However, there is at least one glaring issue with the conceptual alignment. The line crosses University Bridge and enters Campus Parkway, a major transit street. It then takes an odd jog down to Pacific Street between Brooklyn Avenue and University Way. Apparently, the goal of this jog is to serve the University of Washington Medical Center (UWMC), but this routing would fail to achieve that. The proposed stop is over a quarter-mile from the nearest UWMC entry and is next to a parking garage, with no retail or other attractions to speak of currently or in the future. The UWMC is already well served with multiple local and regional bus routes, and will have direct access to downtown via the Husky Stadium light rail station in 2016. This 0.4 mile segment could cost up to $18 million, according to the City’s cost estimate, and cause an extra two or three minutes in travel time due to crossing an additional four intersections. Instead, the line should simply turn between Campus Parkway and University Way (known locally as “The Ave”). As indicated in the conceptual map above, an ideal stop from there would be at 42nd Street. The next would be at 45th Street, which would connect to east-west bus routes and the Brooklyn light rail station. Currently, the final stop would be at 50th Street, which is where the The Ave loses its retail character. However, with money saved from eliminating the Pacific Street segment, the line could terminate 0.4 miles further north at Ravenna Park, a significant neighborhood attraction. An intermediate stop would be on the long block between 52nd and 55th Streets. This area between 50th Street and Ravenna Boulevard is currently dilapidated and could use an incentive for economic investment. At the northern terminus could be a new transit center that connects passengers to buses that serve the Wedgewood, Jackson Park, and Lake City neighborhoods, whose bus lines (71, 72, 73) would be consolidated in the streetcar. Alternatively, those routes could terminate at the Brooklyn or Roosevelt light rail stations to more quickly connect riders with downtown. Concept of a pedestrian-transit mall in the U-District. Click to enlarge and see full image. Running a streetcar up and down The Ave can also create momentum to convert the street into a pedestrian-transit mall, which it practically already is with heavy foot and bus traffic. Parking would be removed and cars prohibited (except for late-night delivery vehicles) between 41st and 52nd Streets; on Saturdays the University Farmer’s Market takes over The Ave between 50th and 52nd, so the line would stop at 50th for the duration. Along with the City of Seattle’s similar pedestrianization proposals on parts of 42nd and 43rd Streets in conjunction with the Brooklyn station, the area could become a pedestrian mecca unlike anything Seattle has ever seen. Removing cars would also speed up travel times. Strangely enough, the 2008 plan has no concept for a streetcar connecting Capitol Hill and the University District. Currently these two high-density neighborhoods are connected by a single bus route, the 49, which has the sixth highest ridership of routes that run within Seattle. (The top five, in order, are the 7, 48, 36, 41, and 8.) An extension of the First Hill line by at least 0.5 miles north along Broadway is already being studied by the City of Seattle. It would make sense to eventually connect it to the U-Link via 10th Avenue and Harvard Avenue. Streetcars can only climb a maximum grade of 9% (about 5 degrees), and both of these streets appear to be below that threshold. A proposal for two streetcar line segments that are not in the 2008 plan. Click to enlarge. Similarly, the termini of the SLU and First Hill lines (after the Broadway extension) are tantalizingly close. There are currently no transit connections between the SLU and Capitol Hill neighborhoods and only two streets cross over Interstate 5. With Capitol Hill being a popular residential neighborhood and SLU continuing to grow as a major employment hub, there is motivation to link the two. The best opportunity is to route a streetcar over the Lakeview Boulevard bridge and Belmont Avenue, both of which also appear to be not too steep. This segment could be part of another east-west line that extends to Seattle Center and the Queen Anne neighborhood; this may be explored in detail in a future post. It would also be worthwhile to explore possible streetcar routes that connect with underrepresented neighborhoods like Lake City and Columbia City, which are also designated as urban villages and where population and employment growth are being focused. While the goal of streetcar transit is to move people quickly and spur local development, an attractive and well-planned route can also encourage less driving. As the fastest growing city in America, Seattle’s leaders must continuing to work with citizens and business interests to provide a efficient and successful transportation system that works for everyone. Streetcars offer a way to improve system capacity and passenger convenience in the city’s most popular corridors and bustling neighborhoods. This entry was posted in Rail, Transportation and tagged Broadway Extension, Capitol Hill, First Hill, network, passenger, rail, Seattle, South Lake Union, streetcar, system, The Ave, U Line, U-District. Bookmark the permalink. A short, inexpensive line connecting Westlake to Broadway via Olive street would quickly create a loop, vastly increasing practicality for all central neighborhoods and multiply earnings. Almost all of your listed benefits to rail can also apply to buses. There’s nothing stopping the city from building nice stations with shelter, lighting, power, raised platforms, etc., and uses them for buses, too. We already have quiet electric buses on many routes. We have many bus routes where stops are further apart, which allows buses to travel exactly as fast as trams that travel on city streets. The two studies you link to (that found people preferred trams) took place in Germany and Switzerland, two countries with perhaps the best tram service in the world. They’re also countries with rich histories of rail service: “tram” is a German word, and Berlin was the second city in the world with service. Could it not be partially cultural? I’m not convinced that this study is *necessarily* relevant to America. Is there any such study that has taken place on the same continent as us? For every benefit of streetcars listed here, a monorail is even better. The stations are nicer, since they’re further from the street. The stops are further apart, and monorails are never held up by street traffic. They’re nearly silent, being electric, and rubber tires make them even more comfortable than a streetcar. Each monorail can carry over twice as many passengers (450) as the streetcar you mention. Of course, monorails are more expensive to construct. Buses can be cheap, especially if you don’t build stations for them. There’s always a tradeoff, and nicer things always cost more. Well we could give all bus stops Rapid Ride-type treatments like you say, but that would be expensive to apply to the entire county bus system. It makes sense to focus improvements on the most well-traveled routes, such as between the U-District and Capitol Hill and Downtown. The City of Seattle has decided that at that point, you might as well do a streetcar. Yes there probably is a similar preference study in the U.S.; it wasn’t one of my main arguments, though. It likely is influenced by culture, but just from anecdotal experience I’d guess it applies here to some degree. Like I said though, we don’t need to entirely deal away with buses. We’ll always need them. Operationally, a monorail is comparative to light rail because it is grade-separated (not running on the surface), so it doesn’t compare as much to streetcars. I wasn’t around during the monorail expansion campaign but it appears Seattle voters have put the issue to rest. Yesterday I got on the SLU street car at virginia at 6pm headed north, the vehicle was tuck sout of virginia through at least 2 light cycles because of a motorist blocking the track (a bus could have easily gotten around) and got stuck again at denny. The ride took 20 minutes for 1.1 miles (after i waited at least 4 minutes while the street car was stuck before even getting to the 7th ave/westake stop). Google says I could walk it in 20, I coulda’ walked it in 15. Google says that ride should have taken 10 minutes. I then hoped to transfer to a 70 to take me to Boston and Eastlake, the first 70 blew right through the bus stop without stopping, so i walked instead. If I had just walked, I would have gotten to my destination at least 15 minutes sooner than having tried to rely on public transit. True this is one anecdotal rant about our mediocre transit and terrible traffic, but why we are investing in extending street cars rather than improving the far cheaper bus service (as the earlier commenter suggests, we have quiet electric buses, we even have low deck buses) is beyond me — actually I know why, because the feds will give us money to lay track, but they won’t support buses. We don’t need more street cars, we need more mass transit capacity, and preferably transit options that are faster than walking for the 1 to 2 mile trip. Street cars do not do that. And I agree that we absolutely need to increase bus service; Metro’s ridership is increasing every year (http://metro.kingcounty.gov/am/reports/annual-measures/ridership.html) and yet service is potentially being cut by 16%! just to be accurate, the feds do support buses, too. Different programs, different pots of money. Streetcars and their rails were developed prior to the invention and relative perfection of pneumatic tires. It’s arguable that the density of streetcars running on rails in Europe would never have developed, if pneumatic tires had been practical and available during the time these systems were established. Cumbersome, inflexible and intensely expensive rails are an anachronism, something worth maintaining where they exist as a legacy but not worthy of emulation in new construction. As others point out, the positive attributes of streetcars can be replicated while shedding the outmoded features. Simply providing rail-less streetcars (aka electric buses)* in Seattle with dedicated lanes would instantly provide the rolling equivalent of streetcars, at vastly less expense and with vastly better adaptability. Again, as others have pointed out, the fixed attributes of rail stations are not something requiring strips of steel laid in the ground. *Much of the streetcar vs. bus discussion seems to be about a semantic distinction having nothing to do with transit per se, but what we choose as a name for a mode of transportation. What you say is true, rubber tire vehicles are inherently more maneuverable and flexible, and all bus stops could be just as nice as streetcar stops (if we had the money). I wouldn’t go so far as saying rail is obsolete, though; look at all of the major cities in the world with their rapid transit systems and European intercity passenger service, along with the impressive American freight rail system. But it is indeed more debatable whether rail makes sense at-grade on busy urban streets. As an Eastlake shopkeeper, the idea of wiping out almost all the street parking along Eastlake Avenue expecting to gain a few minutes of transit speed is beyond silly and expensive. Employees, customers, vendors, parcel delivery services and shop vans need load zones, short-term and long-term parking. Eastlake Avenue is 50 feet wide. Streetcars require 13 foot wide lanes and 4 feet of separation. So how do we fit bike lanes (7′ each direction) traffic lanes (10′ each direction) and parking (10′ at least on side) into the remaining 20′? Eliminate the sidewalks? Hi Jules, thanks for your comment. I’ve never heard from a business owner on the blog and appreciate your insight! Though I’m not too familiar with your neighborhood I acknowledge it’s a special case because of how narrow it is and it only has one arterial with lots of residential development. That said your numbers are a bit off…parking lanes can be as narrow as 8 or 9 feet, and streetcars typically need 11 feet lanes with no need for further separation. It may be a bit tight, but I think some level of compromise could be reached. Eastlake may need to forgo transit-only lanes, which would allow parking to be retained while also fitting in protected bike lanes.